Independent games studio Secret Sorcery recently released a massive update for its critically acclaimed strategy game Tethered including “Untethered” without-VR support for PlayStation 4 and PlayStation 4 Pro. Drawing influence from legendary Japanese animator Hayao Miyazaki and brought to life by some of the talented developers behind titles like LittleBigPlanet, Driveclub and MotorStorm, Tethered combines a unique visual aesthetic with strategy-driven gameplay. This latest update boasts two new control methods, adds dusk and dawn checkpoint style save and divine slow-motion and fast-forward features to play at your own pace. You can also elect to skip the tutorial and dive straight into the game. For PlayStation 4 Pro players with a compatible TV, Tethered now looks even more gorgeous than ever with native 4k resolution at 60fps (only available in ‘Untethered’ mode). Become a Spirit Guardian in Tethered, caring for the adorable and industrious Peeps. Their beautiful island paradise has descended into chaos, ransacked nightly by a plague of wicked creatures. By gathering an ancient and mystical life force known as Spirit Energy and helping the Peeps build up their settlement and resources in preparation for nightfall, you can restore balance and banish the wicked blight once and for all! 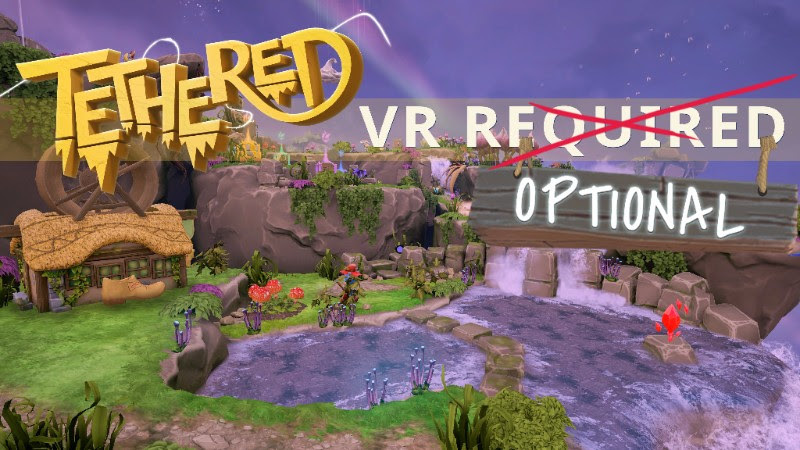 Tethered features 13 exquisitely crafted levels, a competitive leaderboard (which contrasts your godly prowess with that of your friends) and a superb G.A.N.G. award nominated interactive score. Tethered is available for PlayStation VR, PlayStation 4 and PlayStation 4 Pro for £18.99. $24.99, €22.99. Secret Sorcery is an independent British game development studio and publisher dedicated to creative innovation and quality. Established early in 2015 by a group of highly experienced developers looking for a genuine creative challenge, our growing team is passionate about Virtual Reality and the unprecedented levels of immersive opportunity this powerful medium offers. We have, since our formation, leveraged almost a century of pioneering experience to craft original VR concepts and products including Tethered – our magical VR debut. Building on our early success, we have set our sights on the future and carving new paths in immersive content.